The 2010-11 school year is almost in full swing for both year-round (we've been in for six weeks!) and traditional (starts this week!) and like all new school years, it's time for those new year's resolutions. What will you take off your plate this year? What will you focus on in your library media program? Who will you be this school year? 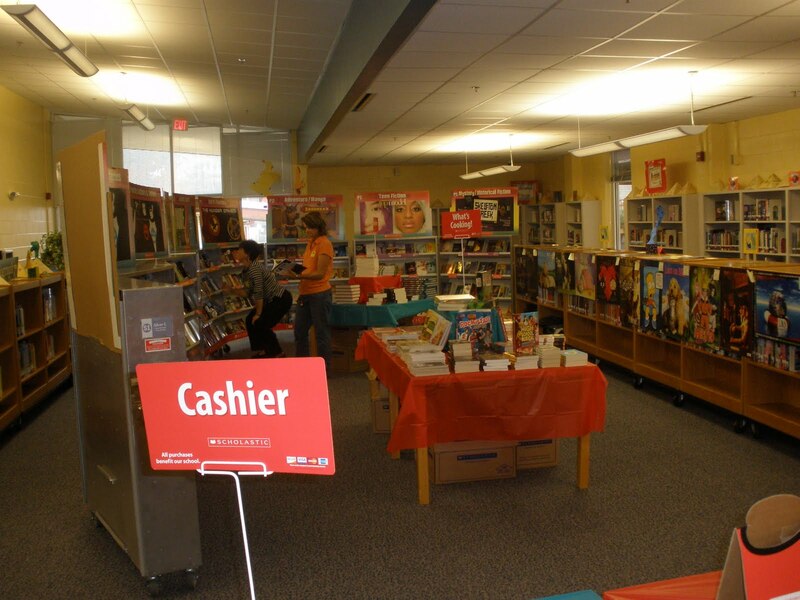 Why Have a Book Fair? The fall book fair started yesterday, and I'm questioning why I REALLY do a book fair. I'm not a big fan of book fairs. Basically, I'm raising money for the book fair company, right? Yeah, yeah, I'm getting books into the hands of students, but they could have checked those out from us FOR FREE! Oh, yeah, we're making a profit that can be used to purchase more books for our library or other incentives like bookmarks, posters, etc. Right! I should probably be advocating for a better book budget from my administrator if I'm using book fair money as my sole funds for my budget. I'm not, thank goodness! I'm just saying, for all the work to setup the book fair, get volunteers, have classes come through the media center, pack it up and complete the paperwork, is it really worth it? I also take a look at what the students have rated a 4 or 5 star. We start reading in February so we've kicked off many that I never really got a chance to look at. I went back and realized that we had kicked of When You Reach Me by Rebecca Stead. I just finished it and found it amazing. It is so perfect for middle schoolers with the main character being 12 years old and quite loveable. I totally got into the way the author keeps the reader engaged with trying to figure out time travel as well as the how and why the characters relate. Intertwining L'Engle's A Wrinkle in Time brings a clever connection that made me flip back to reread a line or two so I could figure it out. The main character, Miranda, has enough curiosity to make you love her but how she reveals her understanding of people and ideas make you know that she is genuine. Don't let the posting on the SLJ mock Newbery blog discourage you. Jonathan's post is way to nitpicky for me. I also read A Season of Gifts by Richard Peck and thoroughly enjoyed it. His appeal may be more for adults?? and I wonder just how much our kids can relate to his outrageous "old lady next door" character. I also wonder how much of the humor is appreciated without the life experiences background that may be needed to get the richness of his writing. Thoughts? Here are the National Book award nominations for this year. I have not read any of them but have two in my hands for the weekend. This is what getting sick and staying home for a couple of days did for me. I like it. What are you reading? I hope to post a few graphic novel reads in a few days or at least I should since I have a huge amount of homework before AASL. Right Mindy? I've been teaching the Big6 research process to sixth graders this week. We've made our way through Task Definition and Information Seeking Strategies. While there have been a few "ah ha" moments with some kids, so many of our students seem to be stuck in Googleland. But only time will really tell. We used their most recent studies of ancient Greece and Rome to talk through and walk through the first steps and there was hand-holding. When we cut them lose in the spring for the big sixth grade research project (a person that changed the world for better or worse), will they take the time to define their task and plan their search strategies in order to locate appropriate resources? Or will they just type their person's name into Google on day one? As you probably know, SSR has been a focus of ours over the past couple of years. The SSR program got off to a great start this year! We did staff development before school started so everyone was ready to go on Day 1. The allotted SSR time is longer this year--closer to 20 minutes everyday--and some teachers are beginning to work in some extension activities: discussion, booktalks, etc. But so far the most gratifying comment has come from a science teacher, and it was about HIS reading during SSR time. He told me that over the summer he managed to read only one book, but within the first few weeks of school he'd already finished a book. The difference, he said, was SSR. "I read my book during SSR, then I'm so interested in it that I take it home and read more in the evenings," he told me. It made my day to hear this, and I hope SSR is having the same effect on students--increasing both the amount of time they spend reading and their reading enjoyment. Are you looking at data? Take a look at the Library Media Program Data Wall we created last week! We started collecting data at the very beginning of this school year by using Zoomerang as a survey tool for all 7th and 8th grade students. Questions pertained to students' past use of the library media center, as well as likes/dislikes/changes they'd like to see in the library media program this school year. Some of this data now appears on the data wall. By using student survey data, we completed a collection mapping project on our sports collection (fiction, biographies, and nonfiction titles were included). These materials are HIGHLY sought-after, yet our collection is out-dated and poorly reflects student interests. We have already designated a portion of this year's budget to updating this popular segment of the collection. We are also tracking library media research class usage. Because we're always striving to increase our true collaborative partnerships with teachers, we're focusing on who is signing up for research and what projects they're working on. We're confident we will meet our goal of increasing true collaborative experiences. So . . . . what type of data are you looking at? Ah! I feel refreshed and energized to start the new year! Why? Because our learning team met yesterday. It's amazing what a group of people can do for you. The collegial relationships and friendships that we have built, that have grown, in our learning team can really sustain you. Yesterday was an incredible morning of reviewing where we've been, where we are, and where we are going. It's hard to believe that the group began six years ago as 'Creating a Climate and Culture for Reading', a group of middle school media coordinators looking at reading in our library media programs and schools. We've evolved into a group of nine middle school media coordinators who look to one another for professional advice, for support and inspiration, and for challenging and though-provoking conversations about everything that is school and library media. It's this small group that helps us see the big picture! As we prepare for another school year, we begin to focus ourselves and our work in our learning team. We will continue to look at the beliefs from the standards through the eyes of various individuals as we set goals for ourselves, our programs and our learning team. I say, "Bring on the year!" "Books, Bytes, & Grocery Store Feet"